By Tom Kertscher on Monday, December 29th, 2014 at 1:08 p.m. Hot stuff: The seven claims in 2014 that we rated as false and ridiculous. 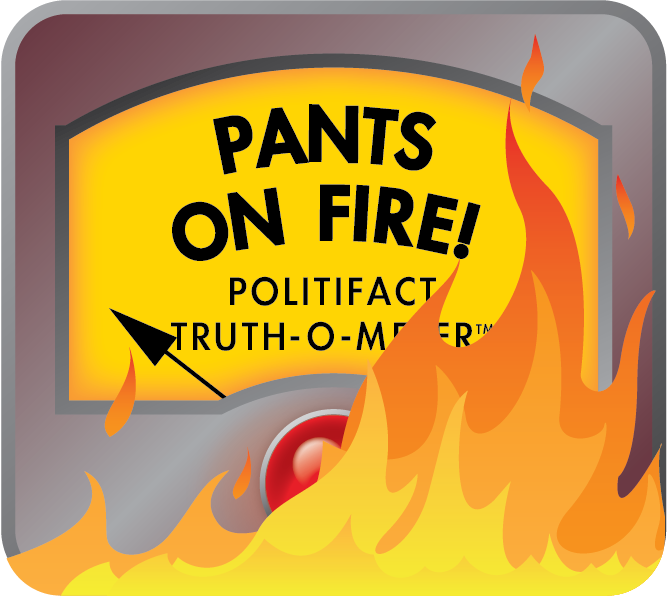 Among PolitiFact Wisconsin readers, perhaps the favorite rating on our Truth-O-Meter is Pants on Fire, which we use for claims that are not accurate and ridiculous. In 2014, we gave a Pants on Fire to seven statements. Here they are, ranked by the number of page-views they received on PolitiFactWisconsin.com. 1. Ron Johnson: "The average rate of fraud" in the Earned Income Tax Credit, Medicare, Medicaid and food stamps programs "is 20 to 25 percent." The Republican U.S. senator made the claim about four government assistance programs during a talk he gave at "Pints and Politics," a regular gathering for conservatives at a suburban Milwaukee restaurant. Improper payment rates are in the 20 to 25 percent range in the tax credit program -- but are 10 percent or less in the other three programs. More importantly, those are error rates; there are no figures on the rate of fraud, which is believed to be a small component of errors. Democrat Mary Burke made that claim during her unsuccessful campaign to unseat Republican Gov. Scott Walker. But unemployment didn’t go up during Walker’s first term, it dropped. Burke defended the claim, made in a TV ad, by saying 4.8 percent was a reference to when she served as state commerce secretary, which was several years before Walker became governor in 2011. But the ad gave no indication that was being used as the comparison. Moreover, during Walker’s time as governor, unemployment started at 7.7 percent, not 4.8 percent. And rather than trending upward, the rate steadily dropped to near 6 percent at the time of our factcheck. 3. Wisconsin Democratic Party: When asked by a reporter whether he’s at the center of a "criminal scheme" to violate campaign laws, Gov. Scott Walker nodded yes. This claim had to do with the suspicions of prosecutors, in a secret criminal investigation known as a John Doe, that Walker helped run a "criminal scheme" to violate campaign laws. The party posted a web video that ended with a clip of questions and answers between news reporters and Walker. In the clip, Walker appears to acknowledge guilt in the case. But in reality, the governor had answered with an emphatic "no." The editing of the ad left the viewer with the misleading and ridiculous impression that Walker was somehow admitting guilt. 4. Mary Burke: "Wisconsin wages are declining at double the rate of other states." Wisconsin wages were declining in one quarter ending in September 2012. But after that, Wisconsin wages were not declining at all. In fact, more recent data showed Wisconsin’s average wages not only growing, but topping the national mark three quarters in a row. 5. Mary Burke: Scott Walker's income "tax plan is a tax hike. It increases taxes for nearly 80% of the people in the state." Burke charged that Walker planned to end the state income tax and more than double the state portion of the sales tax. Walker had said he wanted to explore the possibility of eliminating the state income tax, which likely would trigger some increase in the state sales tax. But he had not advanced a plan to eliminate the income tax, nor to raise the sales tax by any particular amount. 6. Scott Walker: "Mitt Romney did not run his campaign on the basis of arguing his experience in the business world was a reason to vote for him." Walker claimed that the 2012 Republican presidential nominee didn’t run on his business resume. But we found Romney, from day one until the eve of the election, hammered home his private-sector time, as did campaign surrogates -- including Walker himself. 7. David Cullen: Action by the Milwaukee County Board will "provide the County Executive with the same level of security as the Governor and the Mayor of Milwaukee while saving taxpayers $300,000." Cullen, then a member of the Milwaukee County Board, emphasized how much the board’s action would save taxpayers. But there were no real savings, given that the extra security for County Executive Chris Abele cost taxpayers more money. Even at that, we found Abele’s personal security would fall far short of Walker’s and that of Milwaukee Mayor Tom Barrett.